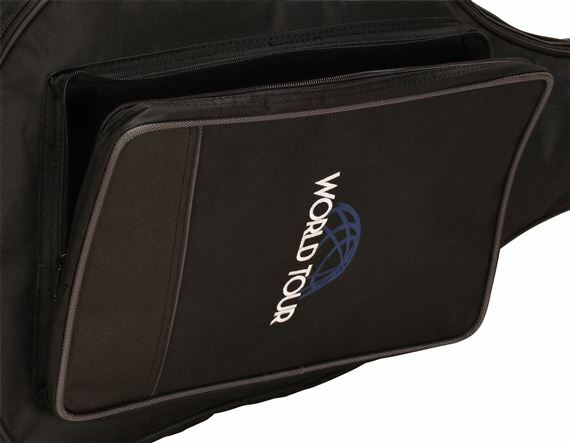 Shop World Tour GBELECN Deluxe Electric Guitar Gig Bag from AMS and enjoy Fast & Free Shipping. The World Tour GBELECN Deluxe Electric Guitar Gig Bag is economically priced while offering protection not seen in bags at twice this price. This quality gig bag features high-density padding on all sides, covered with a water-resistant, PVC-backed Cordura exterior material, and fine scratch-proof Cordura interior. Other features include a large gusseted storage pocket; a traditional handle and a back-pack style transport attachment; interior neck, tuner and bridge patches to prevent tearing; and strong metal zippers with metal pulls. 5 Year Warranty! Good bag for the price. For the price this gig bag is perfect. It's a nice little Gig Bag for the money. The padding is thin, but it's enough to protect your guitar. What do you expect for the price?. I'm happy with it. This gig bag is very protective. 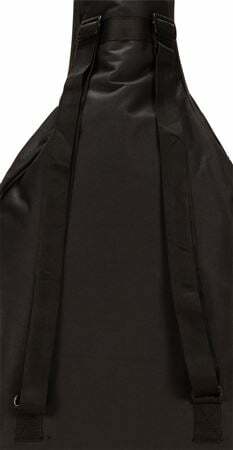 It is attractive and has a huge front pocket to store all of your guitar accessories. I bought this gig bag as a birthday gift for my husband and he loved it. Great quality at a price that can't be beat! What an excellent deal! Great quality at a price that just can't be beat. You will not find a better value anywhere! For the price, it's about what I expected, a thin slipcover. I didn't plan on carrying the guitar anywhere in it, so it works for what I wanted but if you do plan on carrying your guitar around I would pop more $ and get something sturdier.